For continuing the ‘Agile Olympics’, I created Agile Golf. You can use this exercise for Retrospectives, ‘blue sky thinking’-sessions and strategic meetings. A golf course contains normally a track of 9 or 18 holes. In this exercise of ‘Agile Golf’ we played for 6 holes, but you can vary and take more if you have enough time! Please feel free to adapt this exercise to your own needs! First, prepare the wall with your ‘golf holes’. Make sure there is enough space below the topic to post IndexCards. In addition, make sure there is enough space between all topics as there will be also StickyNotes posted. Hide all topics with a white sheet of paper so that nobody can see what comes first and will be the next topics – this is important for participants to concentrate exactly on one topic at a time – the one you’re trying to ‘hit’. Make IndexCards available for the team and reveal the first ‘Golf hole’-topic. In our exercise it’s ‘Materials’. Set a timebox of 1 minute and ask participants what should we do to perfect the materials we’re aroking with? Each participant should create 5 topics at least! After one minute, let participants post their topics below the ‘Golf hole’. Let them remoce doubles and make a dot voting on the topics. Find out what are the ‘top 3’ and remove all other topics from the wall. Reveal the next topic and repeat the process of creating improvements until you have found out the ‘top 3’ improvement for every single topic. You can see the three topics of each ‘Golf hole’ as a challenge you need to tackle in order to perfect that ‘Golf hole’-topic. You have now prepared Agile Golf Course! This should be handled within 30 minutes. In the next step, you introduce the golf clubs on StickyNotes to the team, there are 3 available. The colours you are using are important as each colour represents a special golf club! Every patricipant has these 3 ‘golf clubs’ available. These are called ‘company’, ‘team’ and ‘personal’. After introducing these golf clubs you can start the Agile Golf Tournament. You start at the first ‘golf hole’. Provide the coloured StickyNotes. 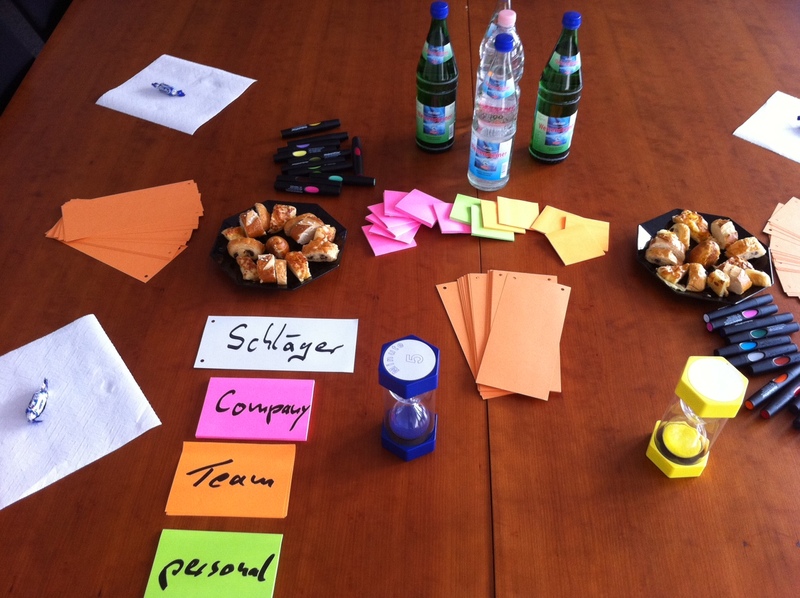 Each participant need to have enough StickyNotes of the three golf club colours. Again, you set a timebox of 1 minute. Now the challenge is that each participant need to create as much solution-combinations as possible. For each improvement a valid solution-combination means to have used all three golf clubs for providing a valid proposal. 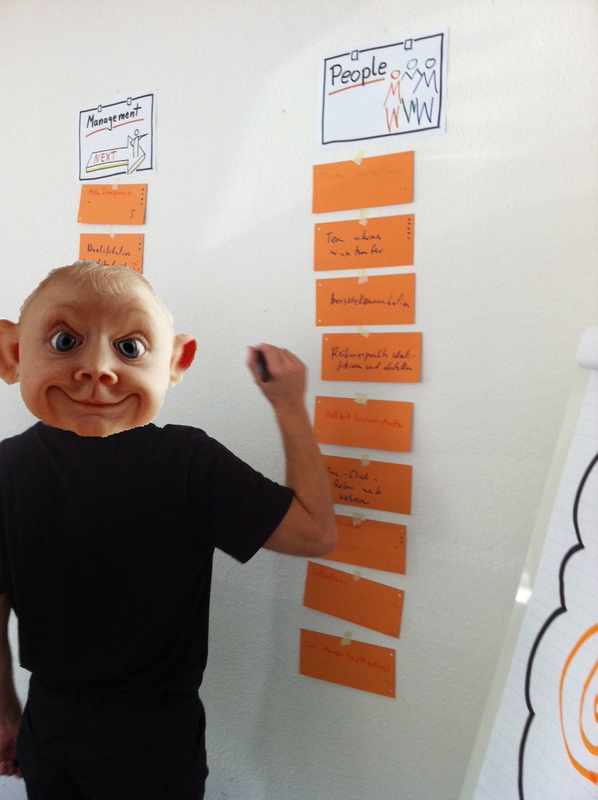 For example, for improving a topic, I could/should do… (green StickyNote for persoanl), the team could/should do… (orange StickyNote for the team) and the company could/should do… (pink StickyNote for the company). As a variation you can use more than three golf clubs – just use additional colours for additional roles like Management, Sales, Marketing… Feel free to adapt as it’s useful for you! Let participants post their solution-combinations of StickyNotes diretcly beside the relevant topic of the golf hole improvement as you can see it on the right picture! As you can see, there is just one valid solution-combination for the first improvement, non valid for the second and 4 valid solution-combinations for the third. That does not mean that the non valid solution-combinations make no sense, absolutely not – perhaps I don’t need an action from one of the roles to solve/improve a topic. On the other side of the coin, this exercise has the intention to involve all roles represented as golf clubs! Each participant should now explain her solution-combinations shortly – no discussion about it at this point! As a ‘little motivator’ you can give candies for each valid solution-combination.